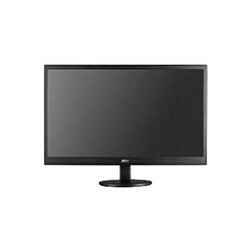 Our range of products include aoc e1660s led monitor. Sleek in terms of design, this AOC E1660S LED Monitor has a high brightness rating. Ultra Low Power Consumption: The LED backlight panel requires 50% less energy than typical 4CCFL monitors. Hair-Line Texture: Brushed surface texture provides a luxury look and feel. Dynamic Contrast Ratio (DCR): Ultra-high Dynamic Contrast Ratio of 20,000,000:1 displays darker images with more depth and detail. Off Timer: To save power, a timer can be set to automatically turn off the monitor after a user-defined interval. e-Saver: Software enables the user to set low power configuration of monitor when PC is in screen saving, PC off, and user absence. User can choose the time to turn the monitor off, to save power consumption. i-Menu: Included PC software allows the user to change the OSD settings using their mouse. Screen + Software: The bundled Screen+ software splits the PC workspace into four self-contained panes to group application windows for easier viewing. Screen+ also supports multiple monitors.